The Sololift D-2 is an ultra compact lifting station suitable for pumping wastewater from a shower and wash basin. Dry-motor design for easy and clean service.Motor, pump and controller unit are integrated into one for easier serviceability & replacement. The SOLOLIFT2 will remain in place for entire service. 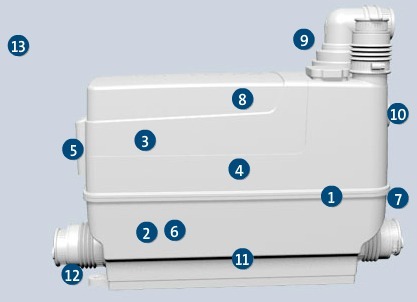 Contains a float switch solution with two start levels, as well as a protection tube and bayonet lock for single service without needing to disassemble the whole pump unit. More compact design. Can easily replace any macerator product on the market. Adaptive height adjustable connectors. Selectable outlet direction for easy replacement. Free-standing or in-wall installation possible.